»Uncategorized»Meet the New 2019 Committee Members! Meet the New 2019 Committee Members! As always, the AGM held in March involved some committee changes! A big thank you must go to those stepping down from roles, your contribution has been invaluable towards the club and hopefully you are now enjoying some free time! And now, BRING ON THE NEWBIES! Fresh faced, buzzing with energy, excitement and ideas, here is your chance to get to know those who have taken on their new roles a little bit better. Starting with a familiar face to most of you…. Hi, I am Erol Ali and I have been a member of Sandhurst Joggers for over 10 years and although my main focus is on running longer distances, from half marathons and beyond, I really enjoy the social aspect of the shorter club runs. I have recently taken lead of the Thursday night club run and I am trying to encourage more club members to give it a try! We run in groups according to ability, and have a sweeper in place to make sure nobody gets lost. You are encouraged to run at a slightly higher intensity than a normal club run, but only within your abilities. Once a month we will organize pacers to run with you for a more structured approach. Do not fear the Thursday night tempo run but embrace it with open arms. Hope to see you there soon! Brunette woman (33). Average pace 7:30 min/mile on a good day downhill. Enjoys climbing, country pubs, town pubs and other pubs. Oh and wine bars. Would like to meet lots of other runners for socials, pub visits and maybe running sometimes if you all feel like it. Can be found at Tuesday intervals and Thursdsay night runs. Used to have closer relationship with Thursday night but that didn’t really work out and they’re now seeing someone else (see above…). It’s all fine though. Can sometimes be found at parkrun but will mostly still be in bed. Looking forward to organising lots of social events in the future! I joined Sandhurst purely to get more serious about my Parkrun training and I got involved in the club in a much bigger way than I could have imagined initially. I knew a few members through handicaps and curry nights from years ago with my Dad who is also a member of SJ and has been for years. I started out in Mike Gascoigne’s slow group on a Tuesday and when I felt it was time to step up I joined Dave’s medium group. This encouragement helped me no end, and I was soon doing the Monday night sessions. I met so many members of the club that I still get on with great. Throughout the year I got involved with more and more club events including the Rivermead Relays and the pairs relay. When the cross-country season came I was keen to give it a go. Claire’s encouragement and enthusiasm was so encouraging and I thoroughly enjoyed the XC league for 2 reasons. The first being: it is a free race that anyone from the club can take part in and there is a friendly competitive atmosphere. The other reason was the excellent social scene afterwards over the excellent buffet after and for the smaller percentage, the post race pint, or two. I was slightly concerned about the number of committee members stepping down this AGM and decided the one role I would be most interested in would be the Cross Country Captain despite the travelling and commitment involved throughout the winter months. I originally decided only to put my name forward if no one else did but the more I thought about it the keener I became. As a result, come the AGM I raised my hand and unopposed I was elected. I am excited to start my new role, do my bit for the club and try and follow in Claire’s footsteps after she did such an excellent job for the last 6 years. When it comes to XC season we need to put together a strong team so an early reminder, please come to the first cross-country if you’re not a regular or haven’t before. It will be much appreciated! I’m Lara Winter, the new secretary on the Sandhurst Joggers committee. I’m 23 years old and have been ‘officially’ running on and off for a year and a half. After finishing university in 2017, I started to feel unmotivated at the gym, and began looking for a new challenge which ended with me booking onto my first running event, the Brighton Half Marathon. I had no idea what I was doing, but I made it through and although it took me a week to recover, I was hooked! Since then, I have run numerous 10km and 15km events including the Muddy Welly (definitely a favourite) and the Windsor Winter run series. Looking for the next challenge, I became a member of Sandhurst Joggers in December 2018 after the club was recommended to me. My first run was Christmas eve, a Monday night Ellis road run to which the total turnout (including me) was four. Despite feeling slightly intimidated by the super fit marathon runners, with their encouragement I somehow managed to keep up. Since then, I have attended many club runs, with my favourites being on Mondays, Fridays, and Sundays. The events in 2019 that I have planned include Endure 24 and my first marathon at Loch Ness in October with fellow Sandhurst jogger and former secretary, Kate Parker. I decided to take the secretary position as I wanted to be able to give back to the club that not only has improved my running ability considerably (demonstrated at the 2019 Brighton Half marathon when I knocked 10 minutes off last year’s time! ), but has also been so welcoming. I was the Vice Chairman at Loughborough University for the water polo team, so have experience of working as part of a sports committee. 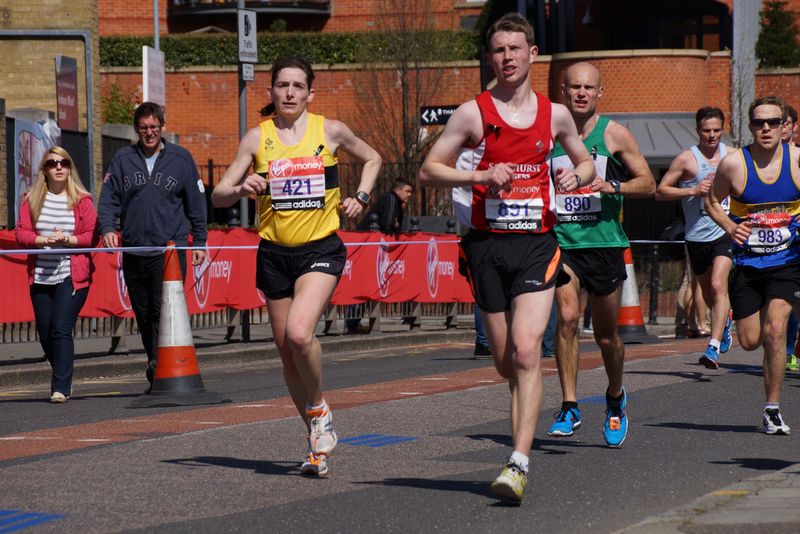 The secretary role includes organising the reports, agenda and minutes for the committee meetings, as well as ensuring the club is affiliated to EA and other road running organisations. It also involves applying for club marathon places and networking with race organisers to try and arrange free and guaranteed places to races for members! Hello! Most of you may not have known me until a few weeks ago, but now I’ve started as publicity secretary, I’m sure that’s changed (although some of you may have wished it hadn’t…). I’ve only been a member of the club since June 2018, taking up running primarily to give myself a new hobby and keep me fit after university. Since joining, I’ve run 3 half marathons and am currently training for my first marathon in 3 and a half weeks, London! When I heard Craig was stepping down as publicity sec, I thought ‘I could see myself doing that’, and here we are! I’ll be that guy pestering you to write up reviews of any events you may have run, and no doubt you’ll be seeing plenty of my stuff up on the website as time goes by! I don’t really have a ‘preferred’ club run, but I most usually attend Tuesday nights, with the odd Monday and Thursday thrown in for good measure. I enjoy attending the club events such as the canal run, the ball, and pairs relay etc, so if you come along I’ll most likely see you there! Look forward to working with everyone, and look forward to hearing all about how many great runs you’ve all done! So there you have it, your new committee members for 2019! Show them some love through the year, as well as the rest of the committee of course, for the hard work that they do is what makes this club so great!